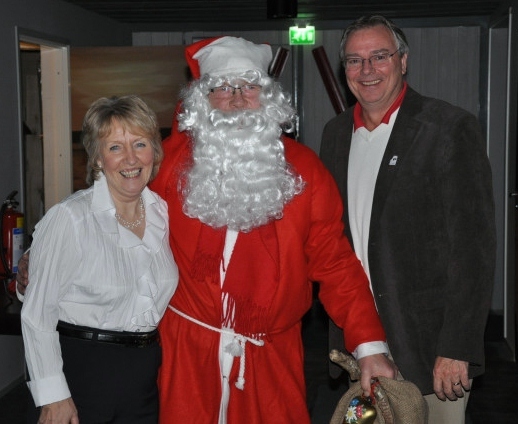 Linda Kirton was Head Umpire at the recent Worlds Qualifying in Lohja, Finland. Many of the teams had their first competitive experience with the new time constraints, especially as they applied to time outs. Here she shares some observations from an Umpire's perspective. I have just returned from the 2010 Worlds Qualifying tournament in Lohja, Finland, where as Chief Umpire I saw at first hand how teams managed their allotted time. As umpires we are there to be helpful, so here is some information offered in the hope it may be useful to competitive teams playing under time constraints at WCF or CCA events. WCF rules dictate that if a team is unable to release their final stone over the hogline before their time runs out, they forfeit the game. While no games were forfeited in Finland, some teams came to within a few seconds of running out of time, and games may well have been lost when last rock throwers were forced to rush their final deliveries. First: understand the rules governing time clocks. 68 minutes per side is lots of time but teams should understand when their clock starts and, as importantly, when it stops. Your clock begins when the other team has exited the target area and the house belongs to your side. Be in position to throw as soon as the house is yours. Lots of time is wasted moving to get into position after your clock has begun. On-ice player assistants, who may be gathering rocks, should have your rock in position for you as soon as you are in position. 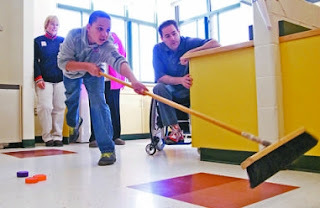 Similarly, curling rules (CCA rule 3(a) WCF R13(d)) state that once you have delivered your stone, you should move out of the way of the next thrower, either forward or to the side. If you sit there and you admire your stone's path, or travel down the centre of the ice to the other end, your time clock will keep running because the opposing skip will not take ownership of the house while you are blocking the view from the throwing end. Second: understand the rules governing "coach interactions," more commonly known as time-outs. The new “coach interaction rule” (WCF allows just one per game, the CCA allows two) says that coaches may talk to their teams for up to 60 seconds BUT your time clock keeps running. This prevents a coach from calling a time out for the purpose of stopping the clock and thus helping a team short of time. The sixty seconds of the actual interaction begins when the team is gathered around the coach. Third: Adjust your actions to your time. Don't waste time discussing when only one option is available. Ask yourself what options do we have? What is the score? How many ends do we have left? Then pick an option and make the shot. The Richmond Centre for Disability is sponsoring their 4th Annual International Bonspiel from December 1-4, at the Richmond CC. Team Canada coaches are forming two teams and Wendy Morgan confirmed that Jim will be playing. Initial team listings show Jim, Darryl, Ina, Sonja and Bruno on one team, with Gerry Austgarden returning to the fold, skipping Frank LaBounty, Whitney Warren and Alberta's Anne Hibberd. Coach Joe Rea may juggle those line-ups during the competition. Korea, who featured in last year's event, are bringing seven players and three players from the Evergreen CC in Portland, Oregon, will compete in a team skipped by Vancouver's Bob MacDonald. One of the Americans, Stephen Hart, recently returned from a spiel in McCall, Idaho where he was the only wheelchair user at the event. 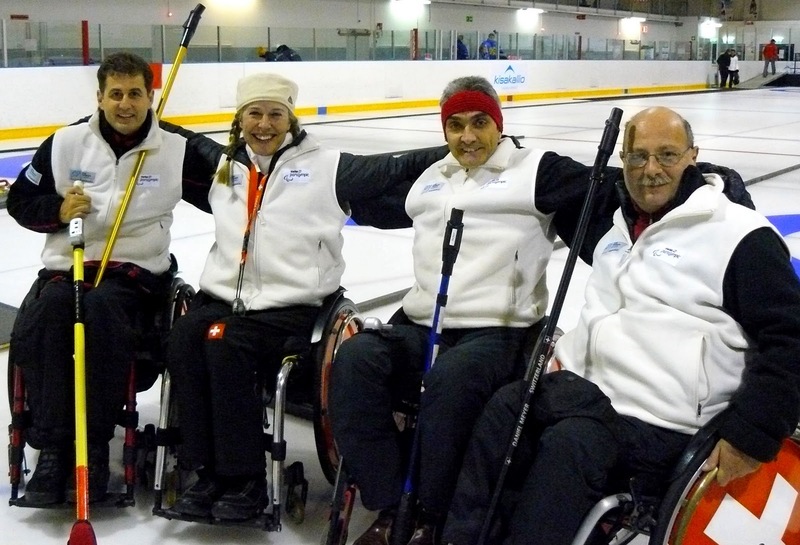 Manitoba's Chris Sobkowicz's team includes Gary Cormack, Chris Daw and Corinne Jensen. Three skips and a lead will be fun to watch. Host Team R.C.D. includes past and present Canadian National Champions Jacqueline Roy, Samantha Siu, Vince Miele, Rich Green and Tom Parker. A seventh team will be made up of those attending but not selected for the other sides. Play begins on Wednesday, December 1st, and concludes with the playoffs on Saturday, December 4th. Prizes will be awarded to the top three teams with $1,000 being awarded to the first place team. There will also be $50 prize money awarded for each win during round-robin play. 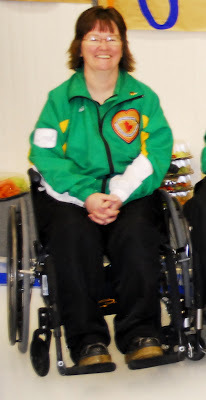 Now that Australia has its first dedicated curling ice at the Ice House in Melbourne Docklands, long time Aussie curling advocate James Oastler has been organizig a wheelchair curling team. The group - skip: Glen Bond, 3rd: Sarah Miller, 2nd: Kon Kiryakudya and lead: Danny Chaplin (positions will change) have been practicing regularly and this past Monday evening won their first game at the Melbourne Summer Curling competition. Playing an experienced able-bodied team, they got off to a great start with a 3 in the first and followed with a steal, only to fall behind 5-4 in the 4th. The rallied, however, to record the first win by an Aussie wheelchair team, 7-5. 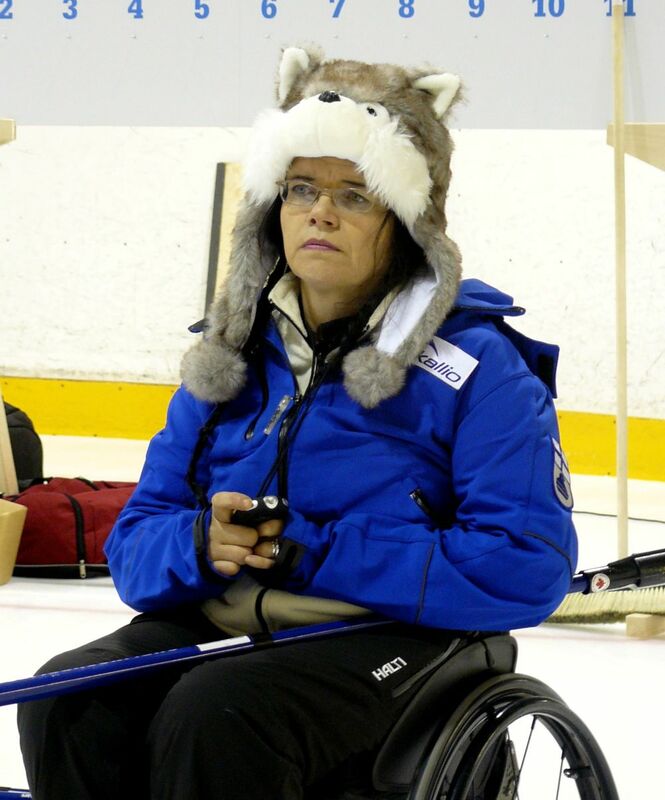 With ten teams in Lohja Finland finishing the Worlds Qualifying, seven teams in Utica NY for the US Open, and six in Prague for their Open (information previously posted), three other tournaments this weekend made it the busiest three days of wheelchair curling since the sport began. In Bern Switzerland, five teams competed for the 2010 Rolli Trophy. Jens Jager's new Mainhattan Ice Wheelers won the event. His team from the Schwenningen CC: Heike Melchior at lead, Uwe Raschke 2nd, and Martin Schlitt at 3rd. Teams from Lausanne, Basel, Bern and Wetzikon competed. Results are available HERE. In Calgary, the Alberta CF and the Calgary Wheelchair Curling Association sponsored Alberta's first Cashspiel, a four team double round robin event at the Ogden Legion CC. Team (Jack) Smart (5-1), with Bruno Yizek, Ann Anne Hibberd, Bridget Wilson and Martin Purvis took the $400 first prize, which they donated back to the club towards next year's event which they hope to schedule in October. Last year's Team Saskatchewan skip Darwin Bender (4-2, $300) brought provincial teammates Gil Dash, Marie Wright and Terry Hart. Michael Alberg (2-4, $200) who is hoping this year to break Chris Sobkowicz monopoly on the Manitoba provincial title, brought Dennis Thiessen, Effie Loubardias and Heather Mowat. A second Calgary team skipped by Dale Keith (1-5, $100) with George Assenheimer, Curtis Junor, Wanda Pizzinato, and Jolly Knowles completed the field. and also donated their prize money. Jim Armstrong and Darryl Neighbour won the mixed Golden (2on2) Stick Spiel in Maple Ridge, BC. 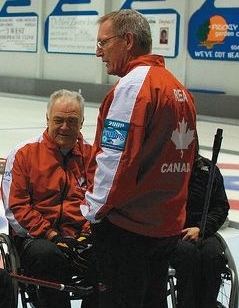 Gary Cormack partnered Chris Daw in the other wheelchair pairing of the 14 team field. Results HERE. Next week is the Cathy Kerr Memorial Bonspiel in Ottawa; with 15 teams expected. Norway won their third successive tournament and notched their 17th consecutive match without a loss, by taking the Prague Open this weekend. Norway's coach Thoralf Hognestad, who took back the reins this season after a year away from the game, took the opportunity to introduce two new players to international competition; Tone Edvartsen and Terje Rafdal. They played with the experienced back end of Rune Lorentsen and his vice, Jostein Stordahl. Germany, skipped by Marcus Sieger, who threw 3rd stones, were tied with Norway and had hammer going into the final end, but surrendered a single for their only loss, 6-5. The Italians, though winless, had three of their matches decided by a single point. USA 1 scored 8 points in victories over Ottawa (8-3) and Quebec (8-5) to go top of the table on the second day of the US Open in Utica, NY. Players on the current USA national team have been divided between two teams at this event, with 'Goose' Perez and Jaqui Kapinowski in USA 1, and Jim Pierce and Jimmy Joseph in USA 2. USA 2 beat Ken Gregory's Bradford team 9-2, and tied 5-5 with Chris Rees' Toronto. Quebec's Ben Lesard, with a win and a loss before their third gae of the day, fell behind Bruce Cameron 5-4 at the break after leading 4-1, but regrouped with a steal of 3 that held off Cameroon's Ottawa team's late rally for an 8-7 victory. 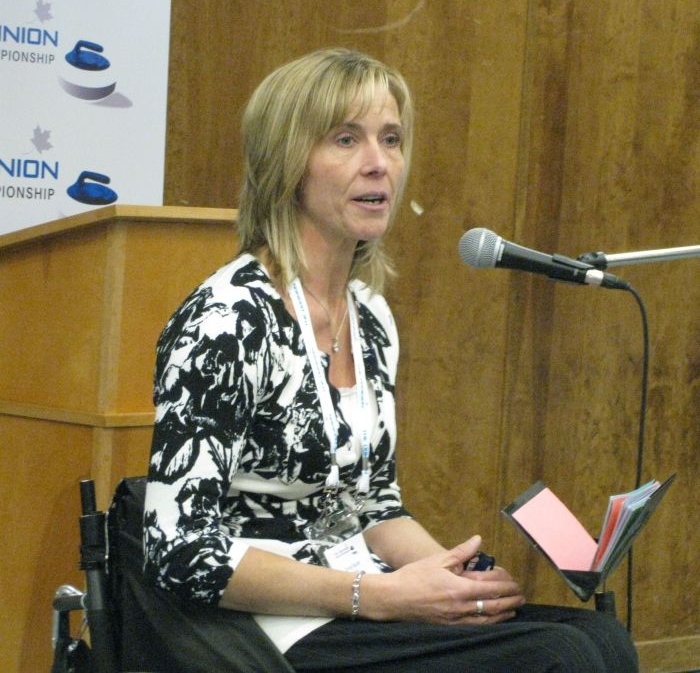 Bradford's game against Toronto showed how unpredictable wheelchair curling can be. Bradford began with three singles, then gave up a 6 to fall behind 3-6 at the break, only to tie the game 8-8 with a 4 in the final end. Newcomers Cape Cod with David Palmer at skip, had never been asked to play three games in a day against experienced opposition, and gave up some very big ends. They could take some comfort from their third game where they kept the 5s and 6s off the scoreboard and held Bradford to 8 points over seven ends. There will be a live webcast of Team USA 1's final games Sunday at 8.30am and 12.45pm local time. The US Open in Utica, NY, features three US based teams and four visiting Canadian club teams. Team USA are searching for a replacement for Patrick McDonald, and expect to experiemnt with line-ups over the weekend. For the two Friday draws Goose Perez skipped USA 1 and his regular vice-skip Jim Pierce skipped USA 2. They faced each other in the opening draw, and USA 2 got off to a promising start when they stole a point in the opening end, but lost 10-4. Toronto beat Cape Cod 9 - 2. It was Cape Cod's first competitive game away from home ice. Ken Gregory's Bradford saw off the challenge of their province's champions, Bruce Cameron's Ottawa. Quebec had a bye. Here are the line scores from the other morning games. In the afternoon USA 1 only managed a 5-5 tie with Bradford, while Ottawa with a steal of 2 in the second, closed out a 7-4 win over USA 2 with another pair in the final end. Quebec opened their account by hammering Toronto with a 4 in the 1st end. They added 8 points in the final two ends for a 15-6 win. Ice conditions are reportedly good, with 4 feet of curl on a t-line draw. Technical problems interfered with the live webcast Friday, but organisers hope that future games featuring USA 1 will be available HERE. Esquimalt CC, on Bc's Vancouver Island, is making big efforts to open its doors to wheelchair users. They have a large ramp to get up to ice level and just this week have installed a large electrically operated sliding door to enter out onto the ice. Last weekend they held their inaugural 2on2 stick bonspiel and wheelchair user Dave Graves, who curls out of Juan de Fuca but practices at Esquimalt regularly, paired up with Ned Nedzelski, finishing with a 2 and 2 record. Team USA's skip Augusto 'Goose' Perez to a very personal message of hard work and fair play to the Mount Anthony Union Middle School last Wednesday. He was invited to speak to students by teacher Brian Keller. You can read what he told the students, what's happening in the photo and what is on the piece of paper he carries when he trains, by reading Daawson Raspuzzi's report in the Bennington Banner. China faced unbeaten Italy in the morning draw of the last day of round robin play at the 2010 Worlds Qualifying in Kohja, Finland, with the winner assured of a place in the Page-playoff top two. China had their perfect record broken by great double take-out that earned Russia a 5-4 win yesterday. Today Italy had no answer to a relentless series of single point steals, China winning 7-1. In the other morning match with top spot implications, Russia began promisingly against Japan, stealing one in the first end and leading 8-6 after 6 ends. Japan outlasted them, however, taking 3 to go ahead, and sealing the 10-8 win with a final end steal. That meant Russia, who had a final round bye, would need help to claim a top spot. Switzerland, who had to win both games to have a realistic hope of a tie-break entry to the playoffs, began the day with an 11-3 win over Latvia. Denmark played Finland, stole 3 in the 1st and 2 in the 5th to go out to a 6-3 lead. The host side tied the game with a steal in the 7th, but Denmark steadied themselves to post their second win, taking 3 in the final end to win 9-6. In the afternoon draw, China beat winless Latvia 12-1 to ensure they would finish top of the table. Russia, and Italy with just one loss, were assured playoff places, which left Japan and Switzerland fighting for the remaining playoff spot. If Japan beat Finland they would claim it. if they lost and Switzerland beat Italy, Japan and Switzerland would play each other in a tie-break. Japan started their match by giving up 4 in the 1st. They levelled the score at the break, but Finland, who'd had a disappointing tournament as far as results went, salvaged some pride by taking the last 6 points in a 10-4 win. Switzerland, with everything to play for, faced Italy and though tied 2-2 at the break, faded to a 7-3 loss. “We feel a little bit sad because the game against Italy was our last chance,” said Swiss vice-skip Claudia Hüttenmoser. “They played better than us and that’s life." This means the top two teams, China and Italy, will play for the first of two qualifying places. The loser of that match will then play the winner of Japan/Russia, for the second qualifying spot. "But who wins the tournament? They play all week, and there isn't a final final?" someone asked. No, and that's why it's called a qualifying tournament and not a bonspiel. Line scores from the games are available HERE. Click on date. Hopefully at least one of the first round of playoff games will be on Sheet B so we can watch a webcast. The top of the table teams continued to win in the morning draw at the Worlds Qualifying tournament in Lohja, Finland, but at the end of the day, only Italy (6-0) remained unbeaten. They have adjusted to the loss of their skip, Andreas Marchese, who had to return home before play began, and as the week has progressed, they have looked more and more comfortable. Russia arrived 10 days early and their pre-tournament training seems to have paid off. They saw off winless Latvia 8-3 in the morning. Denmark fought to the end of their 7-10 loss against Japan, but a steal of two in the 8th was not nearly enough to overcome Japan's steal of 5 in the 2nd. China posted a 4 and a 5 on their way to a 12-5 win against probably the most experienced skip on the ice, Switzerland's Manfred Bollinger. Slovakia is appearing for just the second time at a world level event. In 2008 they lost all their games, but this morning they posted their second win, 8-7 after stealing a point in the last end against hosts Finland. The marquee match-up in the afternoon draw was Russia with one loss against previously unbeaten China. China had the hammer and took one in the first and added a stolen single in the second. Russia pulled level with 2 in the 3rd fell behind by one in the 4th and pulled ahead with 2 in the fifth. The 6th end saw a rare blank, but China could only claim a single point to level the scores after 7. Russia won the match, and second place in the standings, with a double takeout to win 5-4 to the cheers of a large group of Russian spectators. Italy, who had a bye in the morning, buried Finland 11-1 in 7. Japan kept their playoff hopes alive by beating Slovakia 7-5, though the Slovaks gave them a scare by stealing the first two ends. Denmark finally posted a win, 9-6, outlasting Latvia by stealing 3 in an extra end. Italy and Russia are guaranteed a playoff spot and China could still take first place. Japan and Switzerland are also still in contention for the playoffs. On current form, Japan and China both look to win at least one game tomorrow, which will force Switzerland to win both and beat Italy in the final draw to have a chance of playing on Friday. Some random notes: teams are drawing to the button for hammer, and all but Denmark have missed the rings, thus reverting to a toss. Today Latvia came within 3.2 cm, and Finland threw within 2 cm of the pin. It has been snowing and outside temperatures are around freezing. Apparently it's not a pleasant walk from the arena to the dining hall. No one is complaining about the ice, which has maintained decent speed and curl. Chief time-keeper Daryl Kirton (Canada) with a volunteer. There haven't been any time clock penalties, though Russia has had time expire before their final rock has stopped, and Switzerland has run the clock down to less than 10 seconds. The clock operators and on-ice player assistants are from the facility's teaching program. They are training to be Sports Leaders, are young, enthusiastic, very cooperative and quick learners. A 2 on 2 stick curling tournament will be held at the Golden Ears CC in Maple Ridge BC this weekend November 13-14. 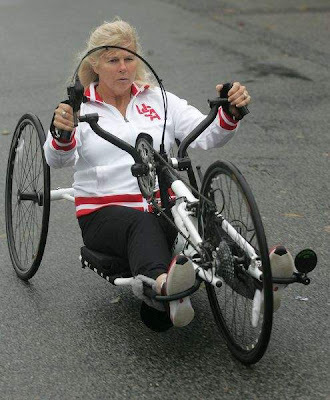 Wheelchair and able-bodied teams will compete together. Darryl Neighbour is scheduled to compete again with his Team Canada skip Jim Armstrong in what would be Jim's first appearance since his legal problems became public. Jens Jäger, no longer skip of the German national team, will nevertheless be competing with his Mainhattan Ice Rollers for the 2010 Rolli Trophy in Bern, Switzerland, this weekend. He will face teams from Wetzikon, Basel, Lausanne, and Bern. Four international teams are traveling to the Czech Republic this weekend for the 2010 Prague Open, November 12-14. Norway's coach Thoralf Hognestad is introducing a new front end to international competition. Tone Edvartsen will play lead and Terje Rafdal will play 2nd. Long time skip Rune Lorentsen and Jostein Stordahl round out the team. Team Germany, having displaced Paralympic skip Jens Jäger, will be skipped by Marcus Sieger, who will continue to play 3rd stones, while Jens Gabel throws last. Stefan Deuschl plays lead and Christiane Steger plays 2nd. Paolo Ioriatti skips an Italian squad with a female, Gabriele Dallapiccola, at 3rd. Poland last appeared in a World event in the 2008 Qualifiers, but none of that team are playing in Prague. Of the four playing now, Eugeniusz Błaszczak played for Poland in 2006 joined by Maciej Karaś in 2007. The Czechs field two teams in preparation for deciding their squad as hosts of the 2011 Worlds next February. Seven teams have signed on for this year's US Open, held for the 5th time in Utica NY from November 12-14. The format is a full 6 game round robin. Team USA is fielding two teams and will be searching for a replacement for Patrick McDonald, out for the season after shoulder surgery. Cape Cod CC is sending a team, and four Canadian teams round out the field: Team Lessard (Quebec), Team Bradford skipped by Ken Gregory, Team Toronto and Team Cameron (Ottawa). There will be a live webcast of all Team USA 1's games, who open against Team USA 2 at 9.30 Friday morning. The final draw is 12.45pm Sunday. Calgary's Team Alberta is hosting a bonspiel on their home ice at the Ogden Legion CC. Team Smart will face Team Keith, also from Calgary, and Team Alberg from Manitoba and Team Bender from Saskatchewan. It will be a double round robin, beginning noon on Friday November 12, with the final beginning 10am on Sunday. 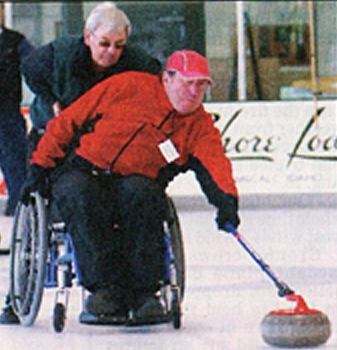 Fredericton CC President/Manager Ed Haggerty writes to say that his club is "coming on fast" in its plans to develop wheelchair curling in New Brunswick. It is the only wheelchair accessible curling facility in the province and is holding a wheelchair bonspiel the last weekend in January (28-30). The club, founded in 1854, was somewhat unceremoniously ejected from its location at the Fredericton Golf (and previously Curling) Club in 2007, but has relocated in the Coliseum on the historic Fredericton Exhibition Grounds. The move has allowed wheelchair access, and this year the club ran a clinic for wheelchair users and prospective coaches, attracting 26 potential recruits and 18 possible coaches. There are currently a core of five regular wheelchair users who come to the club once a week. The club is actively looking for curlers, and with the Nationals looking for a tenth provincial team, prospects are excellent if you live in New Brunswick. Experience is beginning to tell at the midway point of Worlds Qualifying in Lohja, Finland. Italy (5-0) "seem invincible" according to one experienced observer, and stand in skip Edigio Marchese is doing an excellent job guiding the team. This morning's 6-4 win over Japan featured a steal of 2 in the final end of what had been a very tight contest. Several teams have been running their time clocks dangerously close to zero. Japan had only 6 minutes left for their final end against Italy, and even though skip Katsuo had 3 minuets to deliver his final stones, he did not look comfortable. He had to make full 8 foot with his last rock to beat Italy, but his stone overcurled, or perhaps he was tight to the broom. Italy faced an easier challenge against winless Latvia (0-4) in the afternoon, winning 9-3 after leading 7-0 at the break. Japan (2-2) recovered from their morning loss to take an important win over Switzerland (3-2), a team that will challenge them for a playoff place. Again steals in ends 3 and 4 were the difference in a 6-3 win. Switzerland, with hammer, had earlier spotted Slovakia (1-4) to a 3-0 start, but ended comfortable winners 9-3. Unbeaten China (4-0) had a comfortable 9-2 win over hosts Finland in the morning draw, but were almost shocked by Slovakia in the afternoon, giving up a 5 in the 4th and falling behind 8-2. They then regrouped, taking 2 with hammer in the 6th, and stealing 3 in the 7th to pull within one. Another steal of 3 in the eighth gave them a 10-8 win. Slovakian skip Radoslav Duriš had a chance with his first stone of the final end, to throw a guard which would have made it very difficult for China to remove it to score. Unluckily for Slovakia, the attempted guard was hogged. Slovakia still had a chance with their final stone - an open hit, or draw to China's shot stone would have kept their lead intact, but Radoslav was a little inside on his release, his stone over-curled, and China completed a dramatic come back. Slovakia is one of three teams on 4 losses, which I'm sure Vic Rauter would agree in an eight game tournament will be too many to contend. Finland (1-3) had beaten Russia three times in three attempts in pre-tournament friendly matches, so were especially disappointed to lose 10-7 to their neighbours. Finland took 4 in the 7th to go ahead 7-6, but then gave up 4 for the loss. The morning's excellent quality webcast (with commentary) saw Russia play Denmark. The Danes ("we're red. we're white. we're dynamite") have an experienced coach (Per Christensen, who coached Norway at the Vancouver Paralympics) yet they are the only team using what must surely by now be the discredited near t-line delivery zone Great Britain/Scotland adopted. The additional distance meant their lead found it hard to reach the rings, the front even with hammer became cluttered, and Denmark looked every bit an 0-4 team. In what became an all too typical situation, in the 2nd end Danish skip Kenneth Ørbaek had few good options, facing 4 with his last rock. He could have tried a runback of his own stone near the house and centre line, which had he hit it would have at least cut down on the damage. He chose a wide come-around that went through the house. Webcast times don't work very well for those of us in the Pacific time zone, but anyone watching who cares to send in a report is very welcome. It had snowed and froze before Day 2 and despite conscientious wheel cleaning efforts, the occasional rock would hit a piece of the gravel from the paths outside; just one of the worries for ice-makers Jorgen Larsen and local assistant Mika Ollikainen. Team USA lead Jaqui Kapinowski finished 3rd fastest of the women competing in the hand-cycle division of the NY City Marathon yesterday, finishing the 26+ mile course in 2.14.04. Jaqui also has her own website. Hosts Finland, who had a bye in the opening draw when France were unable to compete, faced Switzerland in Draw 2 of Worlds Qualifying. They gave up a steal of 2 in the 1st then exchanged 2's for Swiss 3's, losing 9-6. Russia opened with 4 stolen points against Slovakia, then saw their lead disappear into a two point deficit as Slovakia stole singles in four consecutive ends. Russia took 2 in the 8th and stole a 7-6 win with a single in an extra end. Denmark posted their second loss despite steals in the first 3 ends against Italy, who recovered from 5-3 down after 6, by stealing a 6-5 win. Japan had a comfortable 10-3 win over Latvia and China had a bye. In the afternoon session hosts Finland, despite spotting Latvia to a 5 point lead, all on steals, stole the last four ends to win 7-5. Latvia looked as though they would pull out a win down one in the 8th, with a spectacular double raise. But Finnish skip Tuomo Aarnikka managed a freeze with his final stone and Aleksandrs Dimbovkis' last rock draw went two centimeters too far to force an extra end. Italy continued their perfect start with a win over Slovakia, 8-5. Behind by three after two ends, they drew level on two impressive last stones by stand-in skip Edigio Marchese in the 3rd, and earned their win without the hammer. Russia found themselves down one without hammer after 7 ends against favoured Switzerland, but with a steal of one in the 8th and another in the extra, posted a 9-8 win. China had a comfortable 10-2 win over Denmark. Japan, scheduled to play France, had a bye. 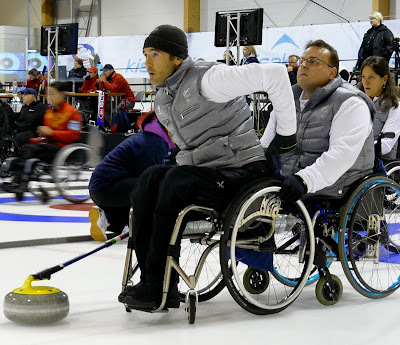 The French team, though disappointed not to be playing, have remained in Lohja and are enjoying the experience of watching international level wheelchair curling. Denmark's Jorgen Larsen is the ice-maker, and ice on the second day, with the arena slightly less cold, was a little quicker and still with plenty of curl. Teams appear happy with the ice conditions. Full results can be found HERE. Click on the date to see line scores. Ten teams hoped to compete in the Worlds Qualifying tournament in Lohja, Finland, for the final two places at the 2011 Worlds in Prague next February. However, a surprise ruling by the French Federation for Ice Sports (FFSG) meant that France has withdrawn, and their game against hosts Finland was declared void. France were apparently caught in a legal dispute between the French Curling Association and the FFSG and were unable to produce the required "permission to compete" form prior to the tournament starting, and therefore had to withdraw. 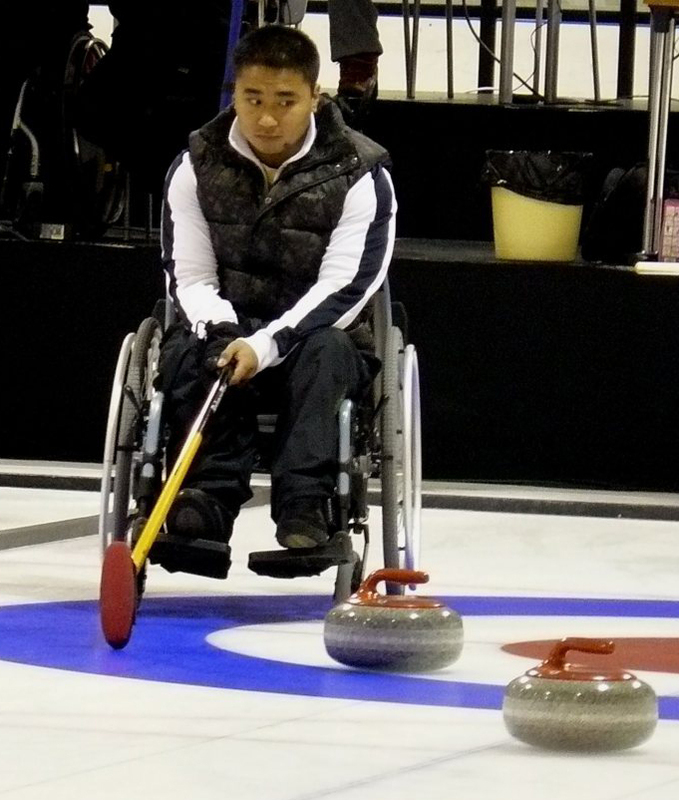 Those allowed to play include three teams (Japan, Italy and Switzerland) who competed at Vancouver Paralympics, plus China who were at the last Worlds, Vancouver 2009. Italy lost their experienced skip, Andrea Tabanelli, who had to return to Italy today. Edigio Marchese moved up to skip and alternate Emanuale Spelorzi played 2nd. Despite the rearrangement, Italy took 2 in the final end to overcome Russia in a slugfest that saw 3's scored in 6 of the 8 ends. Marat Romanov is skipping and throwing 3rd stones for Russia in a change from the website listing. Japan had won a warm-up tournament at Wetzikon (SUI) but started cold against China who raced out to a 5-1 lead after 3, with steals of two in the 2nd and the 3rd ends. Japan came back wth three in the 4th, but never quite caught up; their two in the final end leaving them on the short end of a 7-6 result. 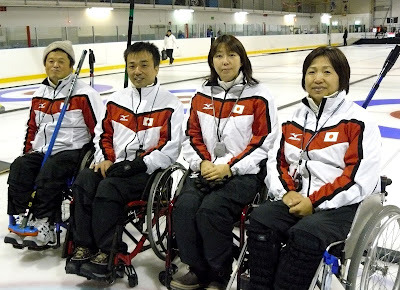 Japan's skip at the Paralympics, Yoji Nakajima, had been registered as alternate, but played 3rd. Denmark attempted to steal their way back into the match against Switzerland but failed to overcome the 5 points stolen by the Swiss, losing 9-6. The Danes were the only team throwing from the rings rather than the hogline, as Scotland throw under Coach Pendreigh. Denmark's coach is Per Christensen who was in charge of Team Norway last season. Slovakia registered their first World level win, breaking Latvia's promising start by taking 5 in the fifth and then stealing their way home to an 11-3 victory. Ice conditions for the only draw of the day were consistent and swingy, but heavy. Hog to hog draw times were 12.5 seconds, and the ice makers hope to quicken the ice for subsequent draws. Heavy ice meant that most of the front end play across the sheets was in front of the house. The better teams at the Paralympics were calling for front stones into the rings, so we'll see whether quicker ice or changed tactics make a difference as the week continues. Line scores from the games are available HERE. Several people have added their honed judgements/wild guesses to the comments at the bottom of the World Wheelchair Qualifying Tournament post. Add yours, and if you include your name you can bask in glory when you're proven right. 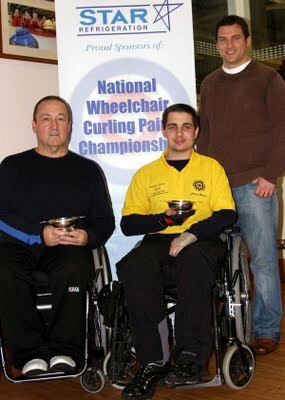 Here's links to the last Qualifying tournament, Prague 2008, the 2009 Worlds, and the 2010 Paralympics. 2008 was the year Germany qualified and went on to win a bronze medal at the 2009 Worlds after leading the round robin all week. It was also the year China emerged on the world stage. They performed creditably at the 2009 Worlds, tying for 5th in the round robin, and 8th post-tie break. That's normally good enough to return at the following championship, but with 2011 host Czech Republic taking a slot, the bottom three teams rather than the bottom two at the 2009 Worlds had to re-qualify. Marie Wright has been named the CCA Female Athlete of the Week. She curls out of the Hillcrest Curling Club in Moose Jaw, Saskatchewan, and has represented her province at the last two national championships. 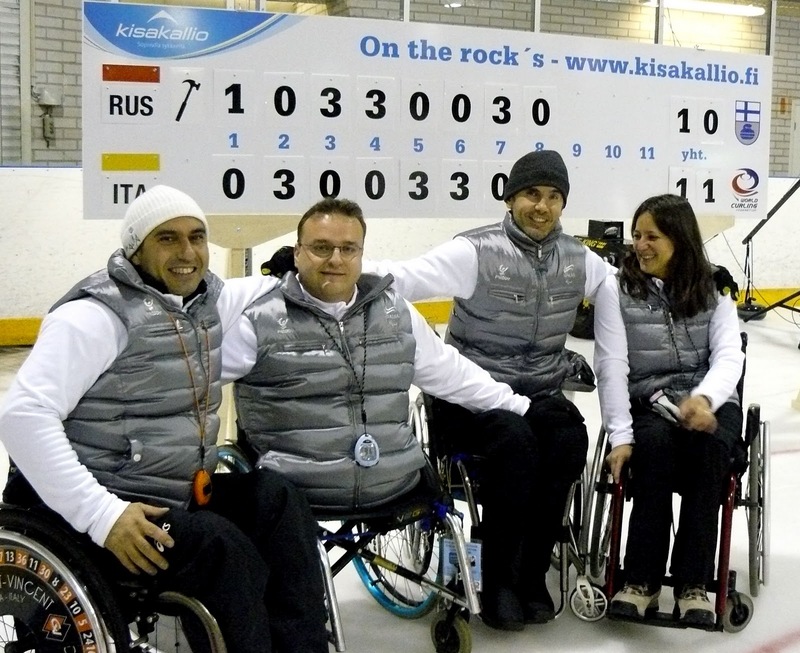 The World Wheelchair Curling Qualifying Tournament begins Sunday November 7th at the Kisakallio Sports Institute in Lohja, Finland. Ten teams will compete: China, Denmark, Finland, France, Italy, Japan, Latvia, Russia, Slovakia and Switzerland. They will play a full round robin, the top four teams entering a Page playoff on Friday November 12. The top two finishers join the top eight from the 2009 World Championships, and will compete in at the Worlds in Prague, February 21-March 3, 2011 for Sochi Paralympics qualifying points. 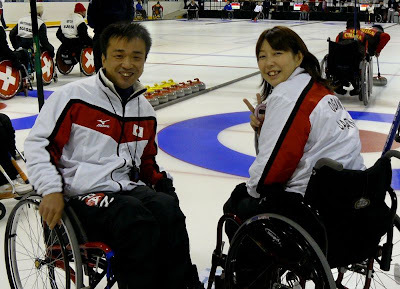 Italy and Japan both played at the Vancouver Paralympics, on the basis of prior World Championship performances. Andrea Tabanelli's Italy (5-5) placed 5th in Vancouver but though they also tied for 5th at the 2009 Worlds, they lost out after a series of multiple tie-break games, falling to 9th and thus forced to requalify. They bring their Vancouver team to Finland. Japan were the hard luck team of the 2008 Worlds, when they were relegated by a couple of centimetres on a pre-event draw to the button tie-breaker. The unfairness of their fate led to a tie-break rule change. This year's Qualifying will be Japan's second attempt to regain their status as a World Championship team. Japan's skip in Vancouver, Yogi Nakajima is listed as alternate for Finland, with his 3rd Katsuo Ichikawa, moving up to skip. Takashi Hidai, at 75 the oldest Paralympian, did not make the trip. Japan is the only team slated to start two women, copying Canada's all-female front end. 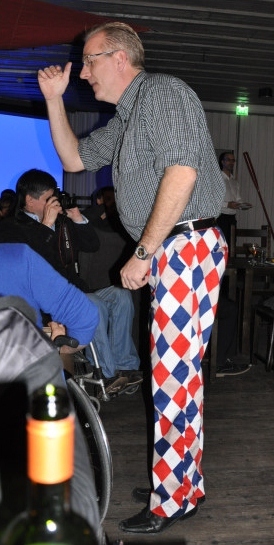 Switzerland's very experienced skip, Manfred Bollinger, will have a new 2nd, Hieronymus Liechtenham. Daniel Meyer replaces Anton Kehrli at lead. Four teams list two female members (SLO, RUS, JAP, FIN). Denmark and France travel with just four person teams. China bring in a new female at 2nd, Guanqin Xu, the only change from the team that befuddled Canada during round robin play at the 2009 Worlds. Denmark welcome back Per Christensen as coach. 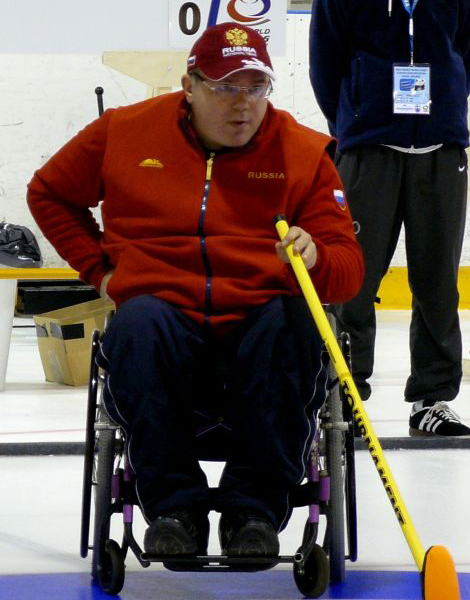 Per was in charge of Norway at the Vancouver Paralympics, but moved back to his home team when coach Thoralf Hognestad returned to his old job. Russia arrived in Lohja at the end of October and have been practicing with their neighbour and host Finland. They are hoping to regain World Championship status after being relegated with Japan at the 2008 Worlds, though coach Vladimir Shevchenko told the WCF media he "believes that the level in this year's tournament will be extremely high and making it to the top two will be very challenging." 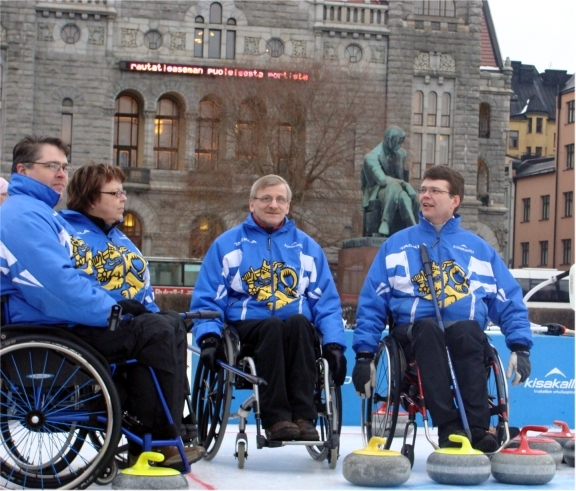 Finland began wheelchair curling in 2007 and have never made it to a Worlds, though they did have an upset win over Team Canada in Prague last November. France, Latvia and Slovakia round out the field. Tournament organizers plan live webcast coverage of games on Sheet B. The first game on Sheet B is China vs. Japan, starting 4pm local time on Sunday November 7. The draw and game schedule can be found HERE and other event information can be found HERE. Team Finland's photo was taken on the railway square in the center of Helsinki, where there is outdoor ice every winter for skating, with one sheet of curling ice at the side. 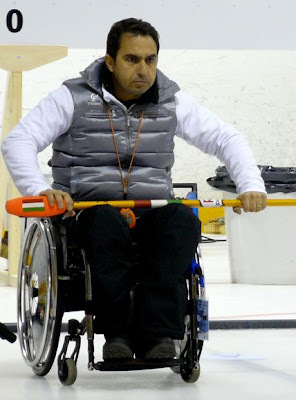 Coach Dan Janidlo, who worked with Al Whittier to establish Quebec's first wheelchair curling program at the Lennoxville CC, has now moved to Montreal. 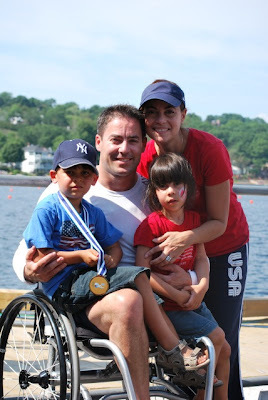 That has not stopped his involvement at Lennoxville, however as he and two wheelchair users and their wives will be taking the two hour drive to attend Sunday practices. 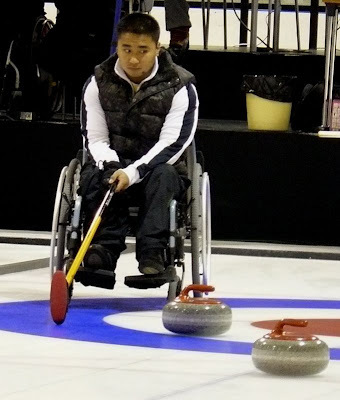 He says: "In addition to an open invitation to all in wheelchairs who would like to try curling we are also inviting families who would like to try curling to come to the curling club." A schedule of this season's practices is HERE and he asks that anyone interested call any of the people at the bottom of the sheet to ensure sufficient resources are available. Team Canada members will get together the weekend of November 19-21 in Richmond BC for the first time as a group since their triumph at the Vancouver Paralympics. Chris Sobkowicz and Gerry Austgarden have also been invited to attend the training camp. While there is inevitable speculation about the eventual status of Jim Armstrong given his legal predicament, the CCA's chief executive officer Greg Stremlaw confirmed with me today that Jim remains a member of Team Canada and eligible for selection to the national side. "I can relay that the process related to Jim Armstrong and our review with multiple stakeholders is on-going," Stremlaw told me via email. "If and when there is information which is to be shared with the public about this review, we will advise in a timely fashion. "That said, I do not expect any developments in the next few days (so) therefore there is no change until such time as these procedures, as a minimum, have been taken." Stakeholders in this context include Sport Canada, who fund the carding system, and Own The Podium who contribute money to the national program. Jim has been taking the occasional practice at the Richmond CC, and is expected to partner with teammate Darryl Neighbour at the 3rd Annual Stick (2on2) Bonspiel at the Golden Ears CC in Maple Ridge BC November 13-14. Speaking of Darryl, he joined coach Wendy Morgan in Winnipeg this past weekend for the second of Team Canada's nationwide tour of talent identification and development camps. Team Sobkowicz and Team Thiessen were joined by Northern Ontario champs Team Ficek for the weekend tryouts.